Nora Shields, Threshold (Blue), 2018, acrylic and enamel on metal, 30 x 14 1/2 x 6". The title of Nora Shields’s second solo exhibition at the Pit, “Harder Volumes,” at first reads as a simple demarcation between the artist’s earlier work, made from more organic materials, and her new series of metal sculptures. However, the use of the word volume—whose etymology links it to the Latin words for scroll and roll—denotes a new relationship to shape and movement, where these durable materials, forged into undulating forms, are suggested to be as pliable as paper. The title also turns out to be slightly ironic, as Shields’s witty, irreverent, abstract pieces thankfully have none of the implied self-seriousness. Shields’s work hybridizes sculpture, design, and, most notably, painting. She often covers her surfaces with seamless, dreamy ombrés, painted without affectation. 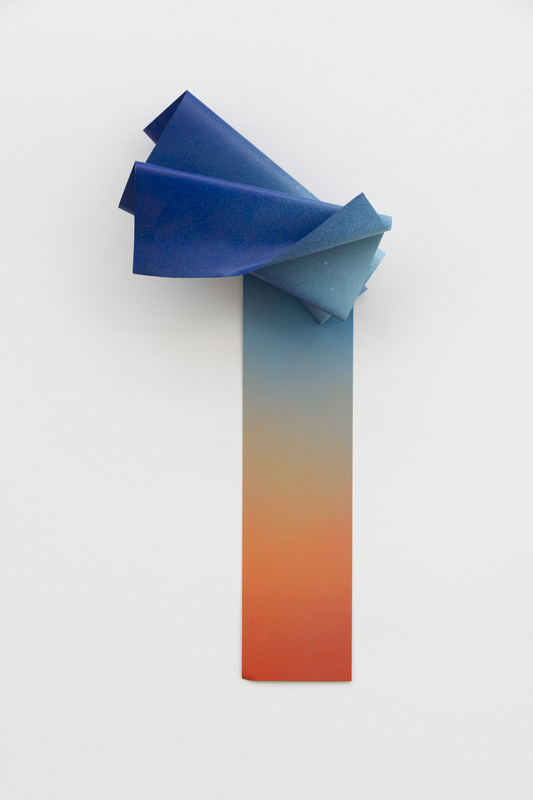 In Threshold (Blue) (all works 2018), a bright orange hue melts into a deep blue on what appears to be a single sheet of thin metal, most of which hangs flat against the wall before collapsing on itself as limply as a Listerine strip. Her “Sash Painting” series is composed of three stylishly crunched sheets of metal painted with black-and-white stripes, each cinched with a different primary-colored band imitating a piece of fabric. Effortless but rigid, these wall-bound sculptures invite a closer look at every brush stroke and crease, returning a viewer’s attention to the verbs behind each formal decision.